This week Josh moved from thirty minute sessions to a full-hour. Partly because we discovered how much time it takes to correctly position him for each exercise. But also because his enthusiasm requires more time. I have seldom seen Josh so excited about an activity. I remembered to take the camera this week. I really want to make sure and document this journey of getting more physical. Realizing that Josh wants this is very humbling for me. I am so often the first person to encourage him to do something. But as Josh got older, and we lost access to physical therapists, I sort of gave up. I thought we had gotten everything that we could get. To see Josh responding to exercise, not just physically, but emotionally, has rekindled hope that I didn’t realize I’d lost. As I ponder that thought, I realize that I had lost hope for myself, too. I was overweight, tired, and discouraged. My struggle with diabetes, and learning how to control the blood sugar, beat me down. I’m not a person who stays down very long. Facing a problem, acknowledging the situation, creates an atmosphere of challenge that fires me up. I didn’t want to just live with diabetes, and the eventual breaking down and wearing out of my body. I decided that I couldn’t make the disease go away, but I could fight the core problem, and stop medicating the symptoms. I analyzed what causes diabetes and figured out that I’d already gone the diet route. And food wasn’t my problem. Every article I read identified belly fat as a core symptom of diabetes. I decided to go to war against fat. So I turned my focus off of food, and onto exercise. I know myself well. I knew that I wouldn’t push myself so I signed on with a personal trainer. By facing the trainer every week, I am held accountable. Because I am Josh’s caregiver, as well as his mother, I took him with me to the workout sessions. And I saw Josh light up. He wanted to work out more than any person I’ve ever been around. Not because he was fighting a disease, but because he wanted physical movement. I wish we could all approach physical activity with the enthusiasm Josh has. Every week, he does something that surprises and amazes me. No reflex, no wind-up. Just a nice, soft extension. You can tell by the smile on Josh’s face, he knows he did something wonderful. This seems like such a simple move, small ball between the knees until you realize that four weeks ago Josh’s legs were so tight you couldn’t pry his knees far enough apart to do this. This is the highlight of the hour for me. Last week, we managed to get Josh out of his chair. This week, Josh got so excited to try standing that he almost got away from us. He has a long way to go but when you stand by him, and feel him pushing on his legs, not once, not twice, but over and over, you can’t help but get excited. During this weeks session, Abby and I got so excited that we must have gotten noisy because the door opened and in came Dr. Christa. A few minutes later, through another door came Jessica, the lady who gives Josh his massages, and finally, when Josh put weight on his legs, even Dr. Gibbs came in to watch. I wish I could share the feeling this week’s ‘Getting Physical’ gave us all. It was a warm, satisfying hour, for sure. Carol – I am so excited for Josh (and yourself!). 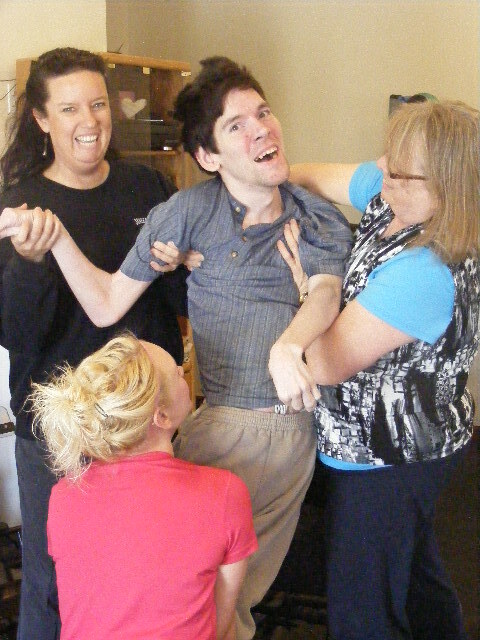 The staff at Riverside is amazing and have done wonders for my own health – I can’t wait to see how far Josh will soar! Truly exciting! I’m cheering him on over here! Riverside is an amazing place. I told Dr. Christa I wish we had photo documentation of his chiropractic adjustments. It literally changed his body. I’m not making that mistake again. It’s too exciting to see the changes that take place. Not just physical but he’s participating and having input into his own physical goals. For me, seeing him actively join in and follow instructions is a feeling I don’t have words to adequately describe. I loved this weeks journey. There just aren’t enough words to let Josh know how much we are enjoying his journey. Thank you for sharing. I know I will see a different Josh in 2 months. I can’t wait for you guys to see him. He is looking better than he has in years. But most of all is his love of life. He’s so eager to do things now. Lots more energy. What a wonderful journey! The look on Josh’s face in all these photos is priceless. No wonder he’s excited! He has a chance for some real change in how his body feels and responds — and that has to be a thrill for both of you. He truly loves movement. One of these weeks I’m going to capture the look in his eyes when he is listening to Abby’s instructions and then following what she says. That intent determination thrills me to my soul. It gives me so much joy to see Josh looking this joyful. That grin I love so much is just a little “more.” Love you both. You hit on what excites me. So often in life, Josh sits back and watches it happen. but in this, he’s asked for it, he’s participating in it, and he’s so joyful. It feels good to see him going after something he’s chosen to do. I’m going to try hard and keep this particular journey documented and updated so others can follow along with him. How wonderful that we have the technology to see the progress that Josh is making. Sending our love and best wishes as he continues to grow in his determination to do the physical activity. Charlene, I’m going to try real hard to keep Josh’s journey updated weekly. It’s so exciting for us to watch and participate in. I want to share that feeling with everybody. Thank you for stopping by the website.